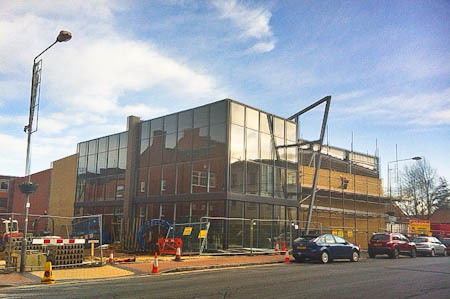 It’s been three weeks since my last cinema record shot, and you can see it’s now starting to take shape, with glass mirrored windows up the front and side. 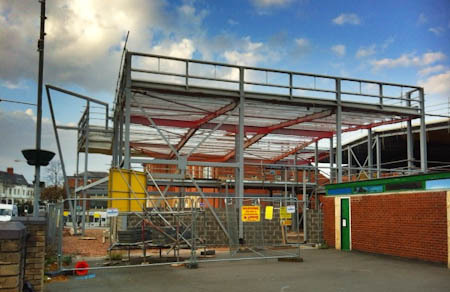 This promises to be an interesting building for reflections when it’s complete. 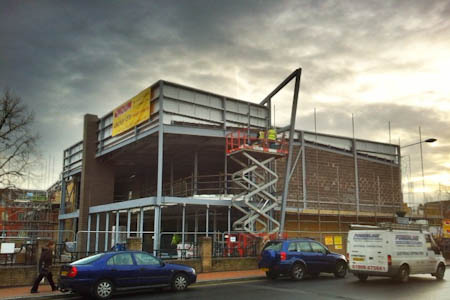 Those who’ve been following my blog will be aware that I’ve been documenting the building of Worksop’s new cinema. 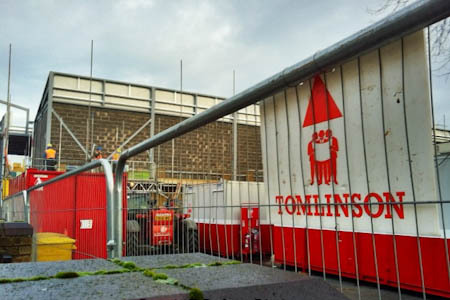 I went a few weeks ago and little change had taken place since phase 6 so I didn’t post my photo. Then I had a week away. So this morning before work, now the nights are drawing in, I visited the scene to find fencing has been put up preventing me from standing in the same spot! Doh…I couldn’t have predicted that. Now I cannot complete my timelapse. Here’s a view from the other side of the pillar I used as a reference point. I need to choose a new spot to finish the series. So I moved across the road and will do a front view, which actually looks better but it’s a busy road so there’s usually cars parked or passing. 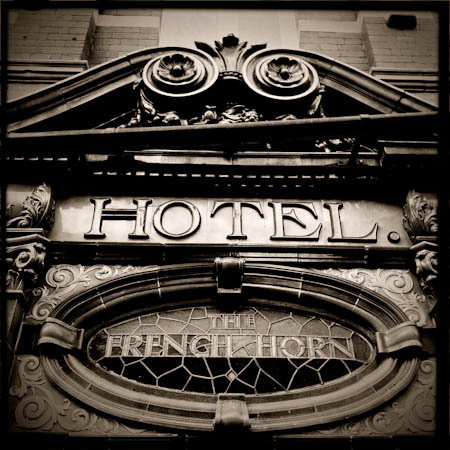 A traditional pub from Worksop that’s been empty for a few years. Renovation work has been done to the roof recently I assume to make the building weatherproof, but the scaffolding has gone so I guess it will stay empty for some time now. I thought I’d take a few shots of the intricate tile and glass work which will probably be lost when the rest of the renovation takes place. Taken with the iPhone and Hipstamatic. Another week passes and not much noticeable advancement. I will continue taking interval shots until the project is finished…and then I’ll go a watch a film. I walked back along the canal today after a visit to the post office. 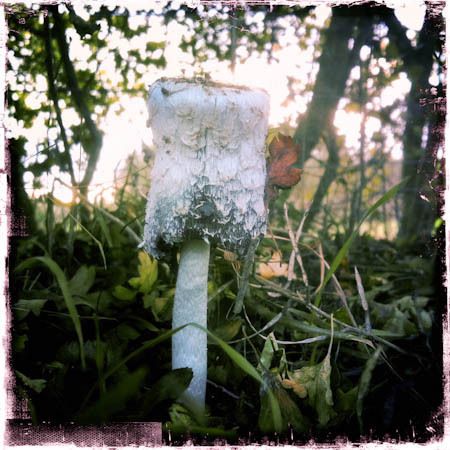 I didn’t take my camera but spotted a cluster of fungi in the hedgerow. I always carry the iPhone so it was time to get the Hipstamatic out. Thankfully it takes decent close ups. This was with the camera resting on the floor I couldn’t see what I was taking but knew the lens was pointing in the right direction. I don’t think the colour of the processing worked well for this so I neutralised the fungi which has resulted in a coloured edge effect. Plan A was to photograph tonight’s lunar eclipse, but with all the will in the world, and no access to the largest wind machine in the universe, the cloud isn’t going to shift. So there’s no moon and I need a plan b. Fortunately I took one photo this evening on my way back from the post office. A quick grab shot on the iphone will have to do today. 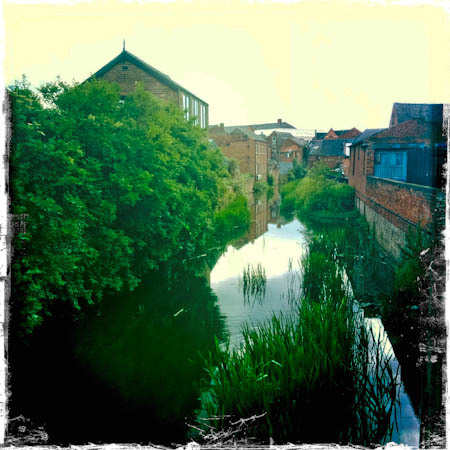 It’s of the canal that runs through Worksop and this is from the back end of the town centre. I like the fact it gives a feeling of the old town, quite industrious looking still. It’s amazing when you open your eyes how fascinating the architecture looks on even the most mundane shop windows. 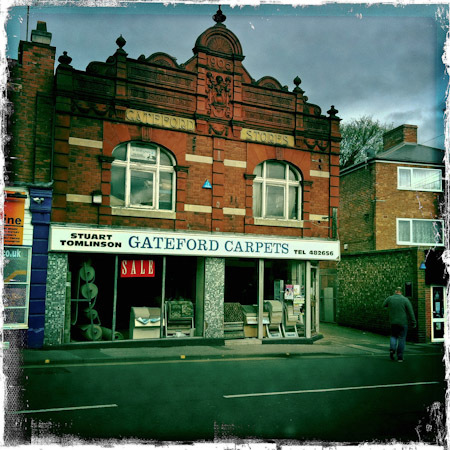 Here in Worksop I have walked or driven past this carpet shop on Gateford Road hundreds of times, but never spotted the interesting detail on the upper areas, until today. I took the photo using the iphone and hipstamatic, but will go back and shoot it again on the proper camera to add to my collection of architecture. 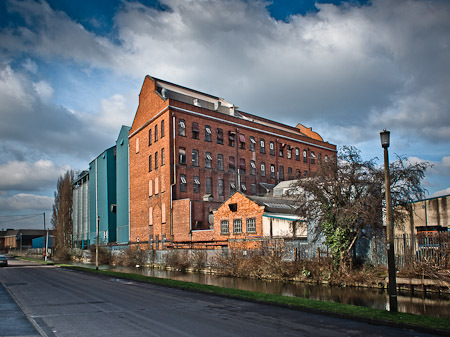 This is Smiths Flour Mill owned by one of the largest independent flour millers in the UK. Worksop has been their head office since 1906. It’s the back end taken from Canal Road with Chesterfield Canal in the foreground. I’ve bumped contrast and colour using Lightroom to give it a tone mapped feel, but hopefully not too heavy. I’ll be taking an Olympus EP2 camera with me more often on my daily walk. It’s small enough to fit in a coat pocket and versatile enough to cope with SLR style shooting. 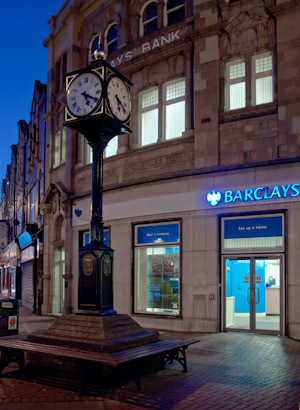 This evening I was out at twilight and photographed the Worksop town centre clock with Barclays bank in the background. The camera is easy enough to handhold at slower shutter speeds and the exposure is quite accurate. I had the 17mm lens attached. 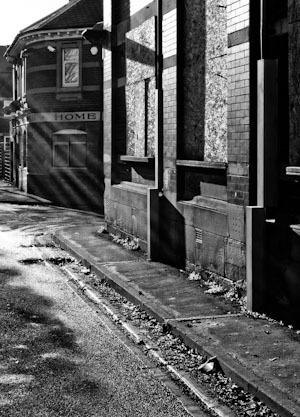 Inspired by ePHOTOzine member Ade McFade‘s passion for photographing the architecture of Leeds and surround areas I decided to do the same in my local region starting in my home town of Worksop. This shot is down a street near the town centre that I only discovered the other day and I’ve been here for nearly ten years! It shows you it’s worth looking around. The building on the right is an old gas building which is what I went back to photograph, but as the light was low and bright I thought I’d take this into the light shot which features the bright rays. I like the fact the word home is the prominent feature…it’s one of the last places I’d want to call home!